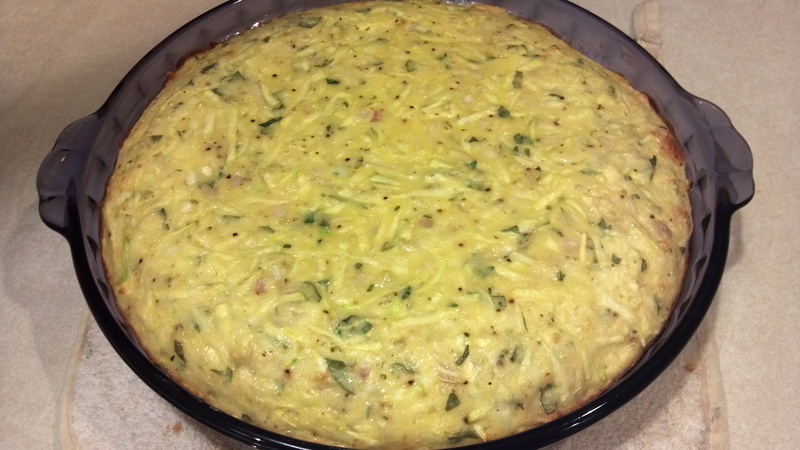 shallots | What's Cooking at the Genua's? Well I am back from the Wine and Food Festival at EPCOT in Walt Disney World. We ate, we drank, we walked and sweated! A great time was had by all! This recipe was actually posted on Disney’s blog before the festival because it was going to be a new dish from a new country at the festival. Belgium. But before I made it or wrote about it I at least wanted to taste it. It was delicious! I would have gotten it again but we were so full we were happy to have tasted it at least once. The recipe looks long and difficult but it’s pretty straight forward. They actually call for fresh mussels that you have to scrub and “de-beard”, which is fine, but I have lots of frozen cooked mussels in my freezer so I will just cook them according to the package. Which is really just heating them up. So either way you want to do this will be fine. I can’t wait to make them at home. Maybe this weekend! If you like garlic and mussels then you will love this recipe. 1. Preheat oven to 350ºF. Remove excess papery skin from garlic, keeping head intact. Cut about ¼ off of garlic head, exposing the cloves. 2. Place each head of garlic cut side up on an individual square of aluminum foil. Drizzle each with oil. Wrap in foil, sealing edges. 3. 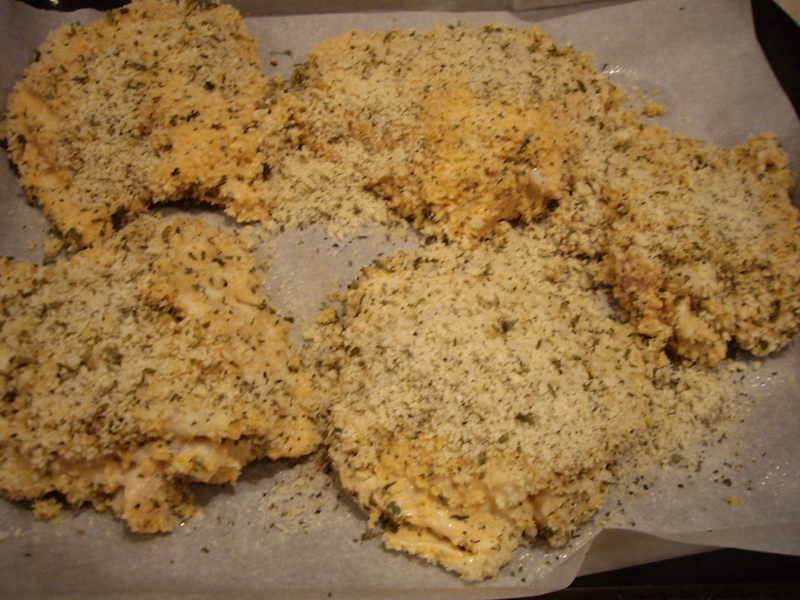 Place pouch in oven and roast for 45 minutes. Cool for 20 minutes or until cool enough to handle. 4. Squeeze garlic from skins into small bowl. Discard skins. Mash garlic with a fork until smooth. 1. Heat oil in a medium saucepan over medium heat. Add shallot and cook until softened, about 3 minutes. Add wine and lemon juice, stirring to combine. Cook until reduced by half, stirring occasionally, about 5 minutes. 2. Add cream, roasted garlic purée, salt and pepper, whisking to combine. Simmer (DO NOT BOIL) until sauce is slightly thickened, about 4-5 minutes. Set aside. 1. Place mussels, wine and water into a large stockpot over high heat. Cover and bring to a boil. Cook until mussels open, about 4 minutes. Remove and discard any mussels that do not open. Strain cooking liquid from mussels and discard liquid. 2. Place mussels in a large serving bowl or individual shallow bowls. 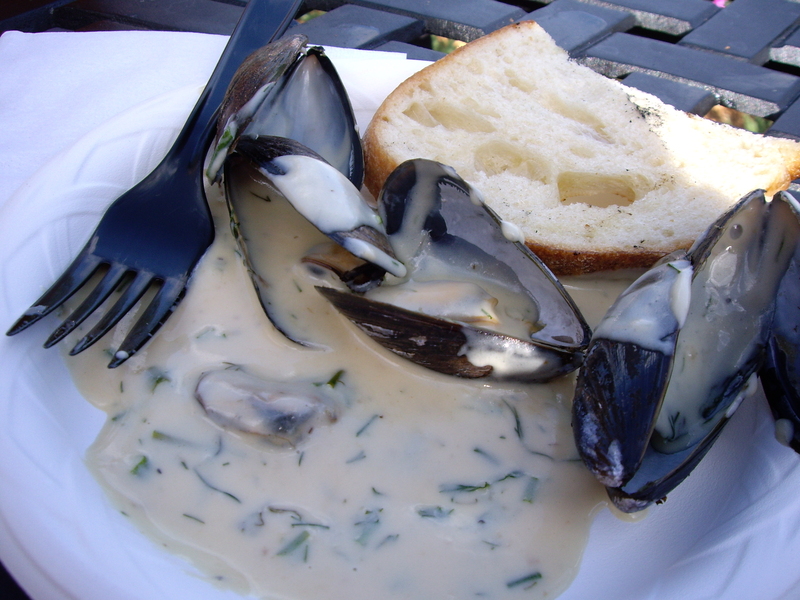 Pour roasted garlic cream sauce over mussels and garnish with parsley, dill and chives. Serve immediately. Here it is again everyone! QUINOA!!! Woo Hoo!! While in Whole Foods last weekend I wanted to get some more quinoa. Looking in the bulk aisle for it I came across the regular white/beige quinoa. 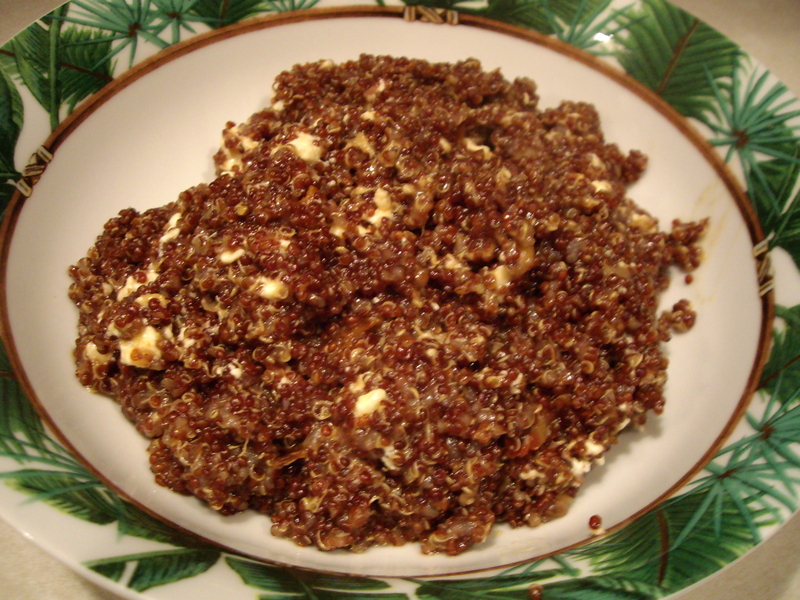 And sitting right next to it was this beautiful red quinoa! Didn’t even know it existed. Then again I didn’t know quinoa existed until a few months ago. I checked the nutritional information and it had almost double the fiber of the regular kind! Sold! I bought a half pound of the stuff, just in case we didn’t like it. I should have bought more! It is so much tastier than the regular. It had a little crunch to it and a nutty taste as well. I then searched online for a different recipe than I made last time. I found a great one on the Cooking Books blog. 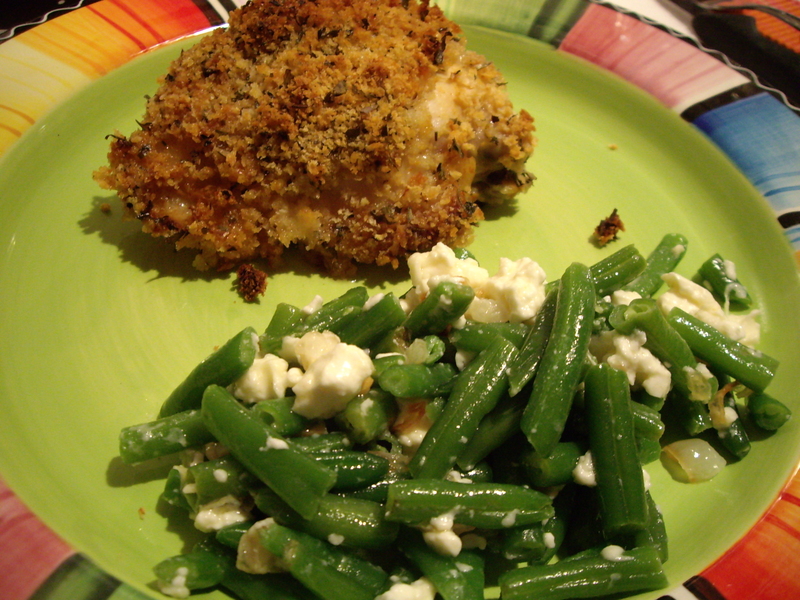 She had gotten it from a cookbook called The Eat-Clean Diet Cookbook by Tosca Reno and adapted it to her taste. I again adapted it to my taste. It called for cilantro and I left it out (My husband isn’t a fan unless it’s in salsa or guacamole) and vegetable broth. I had chicken broth and used that. The recipe called for 8 sun-dried tomatoes, cut up. I found it needed more. So next time I will add more. I think about ¼ cup will do it. 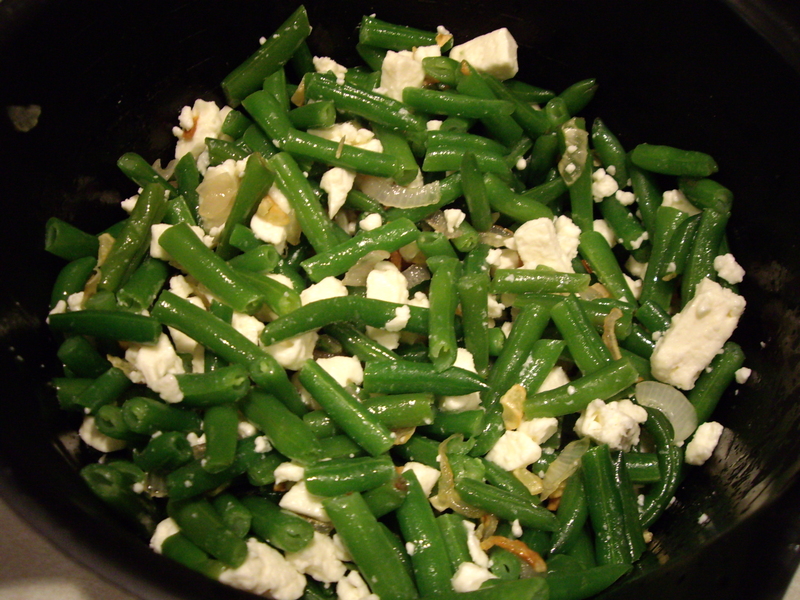 I liked how much feta cheese she said to put in, “as much as you’d like”. Ok, sounds good to me! Sounds good to my husband! I think it was about ½ cup in total, could be more though. I didn’t measure. But one thing I should have done was cut the recipe in half. It made a lot of quinoa for two people. We do have leftovers! 1. Heat the oil in a large saucepan and add the tomatoes, shallots and garlic. Saute for 3-5 minutes until the shallots are soft.